RIORI Vol. 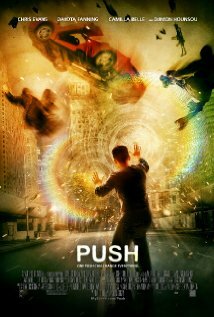 2, Installment 19: Paul McGuigan’s “Push” (2009) | "Rent It Or Relent It"
Chris Evans, Dakota Fanning, Camilla Belle, Cliff Curtis and Djimon Hounsou. A group of young American ex-pats with telekinetic and clairvoyant abilities are in hiding. They were born different, special and criminal according to a clandestine US government agency’s mandate. They now must come together utilize their different talents for a final job, hopefully escaping the agency’s watchful eyes forever. Is Hong Kong sure a crazy town or what? As I’ve pointed out in previous installments I am an unabashed comic book head. Been a collector ever since the ripe ol’ age of 12, and still going strong today (despite the unreasonable prices that get slapped on the covers of recent books, but that’s another story). Make Mine Marvel, as it was declared aeons ago by legions of fans that got behind Spider-Man, Captain America and the X-Men. The X-Men were my favorite. Still are. I know, I know; it’s a bandwagon title. I know that now, but I was 12 once, and didn’t know any better, so back off. I always dug the X-Men for their buffet-style, grab-and-go, cornucopia of freaks and geeks. They’re a goddam mélange of oddballs, outcasts and, let’s face it, mutants designed to create the most off-the-wall plots this side of Stan Lee’s family photo album. The mutants all have a special power (some have several) that makes them unique, but also are ostracized and feared by the general public for said powers. That tension makes for good story, as well as pointed social commentary. Pulitzer Prize winning writer Michael Chabon once put it best; if you were different, you could relate to the X-Men. If you were black or gay or Jewish or a nerd or a geek, you could relate to the X-Men. In the time of post-modern geek chic, the role of the outsider is a point of fascination for the layman, setting the stage to where the rules of conventional society do not apply. Being on the fringe has become vogue, and why shouldn’t stories about them be also? When Cassie (Fanning) shows up at Nick’s (Evans) sh*thole Hong Kong flat bearing news of imminent death, he has only one reaction: snarky disbelief. Who is this girl and how come she claims to know so much about their future—that’s right, their future—anyway? Well, Cassie is a “watcher,” a clairvoyant who has acumen for being artistic as well as being bratty. Nick is a “mover,” a telekinetic able to move things with his mind, and has been using his gifts for nothing better than gambling and mooching off people. His life has been remarkably lame most of the time, drifting from city to city, never ever laying down roots, trying to avoid those pesky agents of The Division. Say hey, what’s going on here? Turns out Nick and Cassie are just two of a huge sub-species of humans, those the children of parents who were experimented on back during WW2 in attempts to make a better soldier. There are all sorts of specials crawling around the planet. Movers, watchers, pushers, bleeders, etc. All of them living in a subculture that cloisters them into factions trying to outdo one another in various power struggles. And all of this under the watchful eye of the sinister Division, a watchdog operation that monitors the actions of those once part of their program. I didn’t want to do this review. I mean I really didn’t. This movie was an utter Greco-Roman clusterf*ck, and I didn’t even have any expectations going in. Push has got to have one of the sloppiest, confusing and most inscrutable narratives I ever had the displeasure to watch. I actually watched Push twice (never a good sign). Once drunk, unable to follow the story, later thinking it was the booze. A second time sober…and I still couldn’t follow the storyline. The damned thing gave me a headache, and not due to any hangover either. The movie tries real hard to fall into the vein of “high octane” action movies. In reality Push is just an X-Men rip-off drunk on Red Bull and angel dust. The problem with most hyper-action movies is that they confuse chaos and collateral damage with verve. Crazy fast action with reckless abandon in this sense just bewilders audiences. It’s numbing to the skull, introducing too much stimulus at once. Not to mention the editing is headache-inducing and relentlessly dizzying. It’s like you’re watching a movie while riding on a carousel that threw a rod. Bleagh. I think high octane is passé, at least to my mind. Push is riding on the coattails on films like The Transporter series’ (or any Jason Statham vehicle for that matter), and in a less fluid manner. Push’s action is an exploding yard sale: sh*t everywhere without much logic or reason. The razor thin plot is almost impossible to divine, and the frenetic pace makes it character development (not that the acting is much of a treat) all but absent. I mean, Camilla Belle has this glazed over look like she just witnessed a car crash firsthand for the duration of the film. That’s the kind of bone you’re left to chew on here. This may seem like nitpicking, because it is. There are so many loose threads wisping about in Push. Like first of all, there’s too much babble. I guess we were trying to world build here, with every inch of flying debris has a meaning, but incorporating so much jargon that it results in speed bumps in the (equally impenetrable) dialogue that it just baffles the ear. And speaking of world building, the trick to building a sci-fi universe like Push fails to pull is this: every character cannot be “special.” There has to be a “control” for the audience to anchor on to. Even the X-Men movies with their colorful casting included normal humans in the plotline. I guess it’s just me, but it’s hard to suspend one’s belief for the duration of a movie like this and not get tired, bored and just plain mystified by the characters’ motives, actions and increasingly confusing special powers. Speaking of action, most of the acting in Push, though obviously not the reason you watch a film like this, is so dry. I understand that these special people live in a world separate from normal ones so it doesn’t shock them when an unnatural act of science belches forth from the refrigerator or something like that (this didn’t actually happen in the movie, but it would’ve cool if it did). In a film like Push, you’d expect a lot of juicy, corny, ridiculous dialogue. Nope, not here. Everyone delivers his or her lines in a short, blunt fashion. They all sound bored. Another point of order on sound: the audio got so muddled I had to turn the captions on. God, I messed around with the remote a lot with this movie. That’s no fault of the actors; shoot the sound guy. Yeah, I’ve ripping on Push pretty bad, and it’s all perfectly legit, trust me. There are always high notes in every bad song. Speaking of which, here is a keen use of music employed here. Punchy songs bookend scenes very well, and it didn’t hurt that the songs were cool. Radio Citizen, yes. Another aspect of auditory stimulus? Well, despite the dialogue being so flat, it did have a level of snark that I could appreciate (me? Noooo). It’s kinda amusing that for all the ridiculousness crashing around Nick and Cassie’s world, they can still be so blasé about it. A little predictable, but still funny. Although most of the acting, though inconsequential, was lame, Fanning did a good job portraying the precocious, streetwise clairvoyant Cassie. The role is kind of an old stereotype, but she carries herself well, so I’ll take it. Camilla Belle on the other hand, had a certain Linda Blair quality about her, like she was an innocent that was gonna pop at any second. It must’ve been the opening scenes in the hospital. Whatever. Belle served as merely a novelty, even if unconvincing in every scene. Why did Push remind me of manga, and not just because it was shot in an Asian locale? Because it was a comic book movie in search of a comic book. There is slapdash action, arching dialogue, over the stop spectacle and an utterly baffling, poorly plotted story that if you were not in the loop, you wouldn’t—couldn’t—follow what’s going on. You couldn’t pluck a recent ish of X-Men, read it and understand what was happening, every with all the purty pictures. Push is all about spectacle, and not very engaging spectale either, due to the impossible to follow story (I cannot harp on that enough). I wasn’t sure if I ever got a hang on what the movie was about. Maybe it was pointless to try. I really dreaded doing this review. I just wanted to bash it out and get on with the next movie. I complained on my last outing that Netflix had sent me a good movie by mistake. Be f*cking careful what you wish for. Rent it or relent it? Like I have to tell you. Relent it. This movie made no damned sense, didn’t try to, and didn’t try to in an entertaining way either. Pass the Aleve. In the opening scenes, Hounsou looks exactly like Isaac Hayes in Escape from New York. I just had to point that out. The latte nab was dumb. All this talk about The Division had “Love Will Tear Us Apart” jangling around in my brain. You gotta admit it: cheesy CGI is fun to watch paired with wire fu. Time to get down with some old school gridiron action with George Clooney and his gang of fellow Leatherheads. This entry was posted in Action/Sci-Fi and tagged Camilla Belle, Chris Evans, Dakota Fanning, Djimon Hounsou. Bookmark the permalink.